Before settling in to make yesterday’s sunset photo I took a few minutes in admiration of the Pinelands of Stafford Forge set aglow by some pretty serious golden hour light. 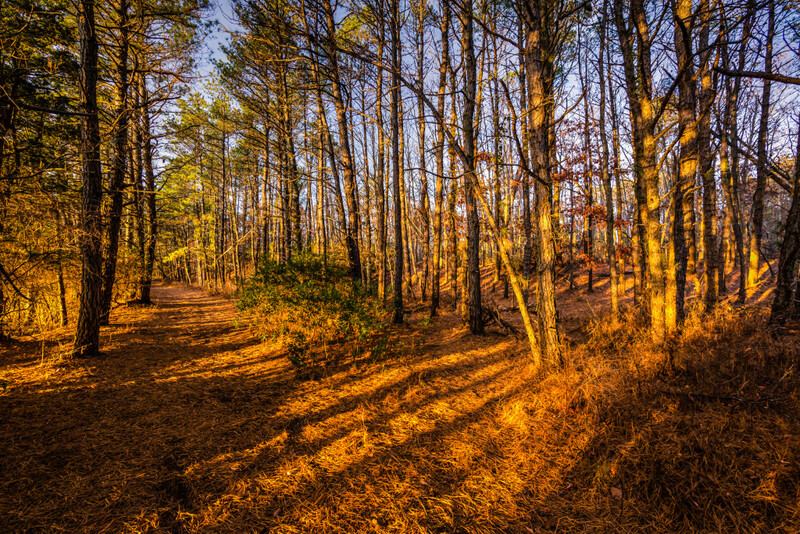 It’s an open secret that I want more forest shots in my photo stockpile, and considering I live on the southeastern border of the great, albeit unheralded Pinelands National Reserve I have little excuse. Coincidentally the bulk of woods shots I’ve managed to produce have come from right here at the Forge, where I’ve already professed my childhood love of the trees. Keeping it casual—which is to say making single exposure handheld shots—I’m able to get my eye in tight to the viewfinder focusing my wandering brain right on the action. Creatively intent on accentuating the vivid golden glow infusing life, warmth, and energy into the millions of felled pine needles; compositionally intent to play off the strong leading lines cast by the scrubby pine tree shadows—the angled left to right action lending a nice touch of directional movement drawing the eye toward the ridgeline up on the right, away from the left side path. Much of photography is about balance, distributing the weight of your subjects until you find equilibrium. Of course like all the rules this too can be broken.